I started teaching today and now reality has hit me. Therefore I have nothing creative to write today, and it is likely that I won't have a lot of time through the week. 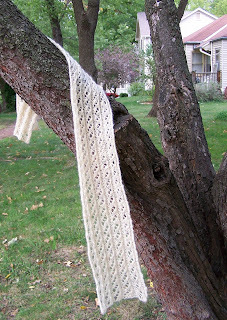 I have decided instead to share with you some of my past knitting projects, one each day. This scarf I knit with some of my own handspun. It is knit in an eyelet pattern from one of the Barbara Walker Treasuries. The wool, if I remember correctly, is a combination of naturally colored Cotswold and Coopworth that came from samples I received when I attended SOAR in 2005. It is not the softest scarf, but is warm when it is cold outside. The scarf is destined for Mongolia. I'll bet it is nice and warm too! What a great use of handspun. I'm sorry I missed meeting you in 2005. Next time SOAR is in our next of the woods, we'll have to plan to hook up! 2005 was the first (and so far only) time I have gone. I did not know anyone when I went. But I do want to go again, and it would be nice to "know" someone there.